These five categories come via Jennifer Novak-Leonard, Research Manager at Cultural Policy Center at the University of Chicago. Jennifer was in Rhode Island courtesy of Catalyzing Newport, a collaborative project funded by the Rhode Island Council for the Humanities and the van Beuren Charitable Trust. Jennifer walked us through both a historical and contemporary look at research on arts audiences and their participation (including snapshots of data from from her 2015 study “The Cultural Lives of Californians: Insights from the California Survey of Arts & Cultural Participation,” which showed that folks lives are highly engaged in the arts, but much of that activity is outside of traditional arts organizations). If you’ve been challenged to assess your value, and have resisted or simply hated being forced into measuring your organization or programming based on its economic impact, Jennifer presented a number of frameworks for assessing impact from the individual to the community. I particularly appreciated these constructs for measuring the impact of an arts experiences on an individual. 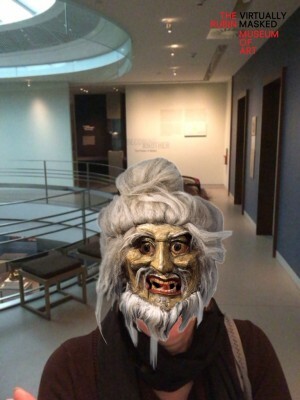 The crazy photo above is from our January visit to the Rubin Museum of Art in NYC. I thought I’d apply just one of the measures, Captivation, to my own experience using Jennifer’s questions. How absorbed were you in the experience? Did you lose track of time? I distinctly remember at least three times during that visit when time did stand still. One was viewing the magnificent Steve McCurry photos, another was watching an entrancing video of a Jain ceremony that involved folks on scaffolding pouring successions of pigments over a towering Buddha, and the third was trying on the video masks representing masks from the collection that you see in the photo. As you know, I’m one for measuring what matters, and for so much of our sector, what matters is how the lives of individual people get better, even for just a moment in time. So check out these studies measuring the impact of your arts or culture program. Even if you aren’t working in a cultural institution, I think you’ll find much to think about.